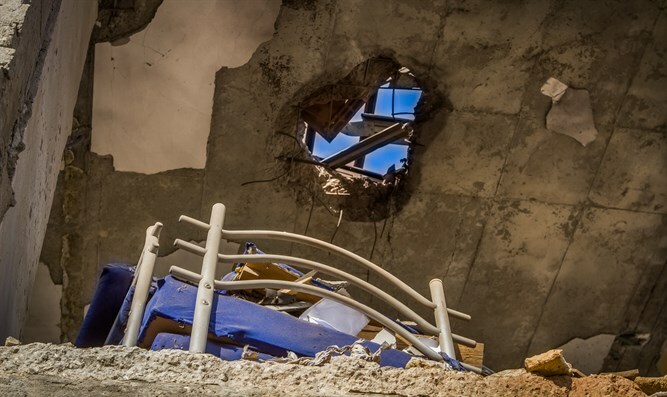 Beer Sheva women recounts dramatic moments running to the bomb shelter before Hamas missile destroyed her home on Tuesday. Miri Tamano was lauded by politicians and citizens alike for saving the lives of her family. By deciding to scramble to the bomb shelter on Tuesday when the air raid sirens wailed, Tamano's actions spared her family from the Grad missile that utterly destroyed her home. On Thursday, Tamano recounted the dramatic moments prior to the explosion in an interview on with Walla. "I heard the siren in my sleep. I thought it was a dream, that I might be imagining the alarm. I pulled myself together and realized that it was true," said Tamano. "I ran immediately and told the children: 'Run immediately to the shelter.' As soon as everyone entered, I closed the door." "We didn't even sit down when we heard a loud 'boom'. I understood that it was by us, but I did not want to tell the children that it was with me. Yedidya began to cry and said, 'Mother is in our house.' So I told him what? You are my magic bunch and no one will separate us. I told them to keep sitting. We waited a few minutes. I hugged the three of them and kissed their heads," continued Tamano. "Yedidya asked me, 'Now we will not have a home?' I told him everything was fine, there was nothing to worry about, they cried, and I told them there was no point crying, we were healthy and everything was fine." Tamano's house had suffered a direct hit from a 20 kilogram Grad rocket, which totally gutted the structure. Tamano and her three children were treated for shock after the rocket landed next to their house, but were saved from far more serious injury by the fact that Tamano had rushed the family into a specially fortified shelter room. Tamano said however that her actions were standard fare for any parent. "I don't feel like I'm a hero," Tamano told Walla. I think it's our obligation to watch over them...I'm a bit agitated. A miracle happened to me and that's the most important thing."